Aboutlaw.com is committed to the protection of personal information of the users of its websites. ABOUTLAW.COM Staff and external processors who have access to personal information and are associated with the processing of that information are obligated to respect the privacy and confidentiality of information. If you visit ABOUTLAW.COM websites to read or download information, ABOUTLAW.COM may collect and store only the following information that is automatically recognized: the date and time, the originating IP address, the domain name, the type of browser and operating system used (if provided by the browser), the URL of the referring page (if provided by the browser), the object requested and the completion status of the request. More information is collected and logged for advanced features, such as placing an order on ABOUTLAW.COM web servers for online payments, downloading from the online library (ABOUTLAW.COM archives), subscribing to an ABOUTLAW.COM or using the personalization features. Anonymous information is collected from visits to ABOUTLAW.COM websites to measure user activity on these websites. This includes analyzing these logs periodically to measure the traffic through the servers, the number of pages visited and the level of demand for pages and topics of interest, and to help ABOUTLAW.COM provide better customer service. The logs may be preserved indefinitely and used at any time and in any way to prevent security breaches and to ensure the integrity of the data on the servers. This information is collected through the use of various technologies, including "cookies". Moreover, the following information is associated with the cookie: IP address, session number, customer ID (first name, last name and job function) and identification number for online payments, if used. If the user has chosen to "remember login and password", those two items are encrypted and also associated with the cookie. When a registered ABOUTLAW.COM user returns to the site without logging in, the ID stored in the cookie is used to track the user (unless the user manually deleted the cookie, at which point the server will automatically create another cookie). If you do not want your transaction details used in this manner, you can disable cookies in your browser. Registration on ABOUTLAW.COM websites is optional. If you choose not to register or actively provide personal information, you can still use ABOUTLAW.COM websites. However, certain features, from ABOUTLAW.COM or affiliated websites that require registration may be unavailable (for example, online purchases or e-mail alerts). ABOUTLAW.COM websites may enable you to communicate with other users and to post information, such as comments on articles, are accessible by others. You should be aware that when you choose to use these services, your information may be available to other users, and ABOUTLAW.COM has no control over the use of your information by these users. You may also choose to receive promotional or marketing information from other organizations linked through our sites. When you do so, ABOUTLAW.COM will only disclose your name and physical and electronic addresses to them. However, you should note that these organizations may follow privacy policies and practices which may be different from those of ABOUTLAW.COM . At any time you can ask ABOUTLAW.COM or affiliated sites not to further disclose your name and addresses by sending an e-mail to the relevant contacts indicated on the website where you registered. 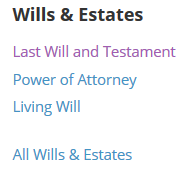 Throughout ABOUTLAW.COM websites, you may find links to other third-party websites. Please note that ABOUTLAW.COM is not responsible for the privacy policies or content on third-party websites. ABOUTLAW.COM websites may also include links to third-party web servers for online payments, which may have different privacy policies. You are therefore encouraged to review their privacy policies, when visiting these websites. You can ask ABOUTLAW.COM whether it is keeping personal information about you, and you can also request to receive a copy of that personal information. As a safeguard against abuse ABOUTLAW.COM will ask you to provide proof of your identity before providing you with any personal information. If you are not able to do so, ABOUTLAW.COM reserves the right to refuse to send you the personal information. This site is hosted on Google servers. While we do not collect any data from our end, visitors should be aware that Google does collect data from visitors to this site and from visitors using any of Google's products and services.